ISBN 0739071025. English. String Quartet. A collection of movie hits wonderfully arranged for intermediate and advanced level string quartets. 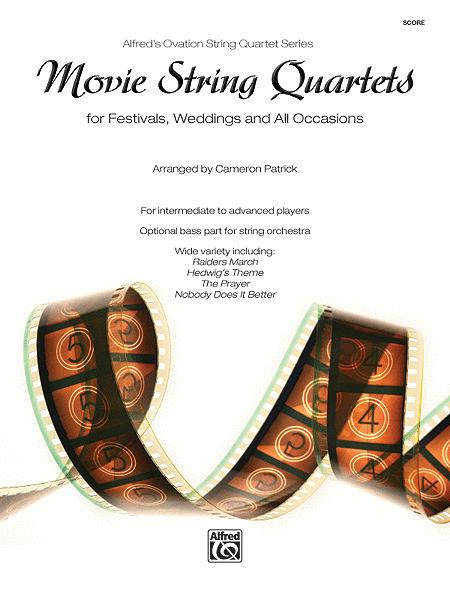 Perfect for high school, university, and professional quartets! The optional bass parts also allow for use in the high school, university or community orchestra. Just the thing to read through at wedding receptions, parties, and other events. Titles include: Nobody Does It Better * Dexter's Tune * Raiders March * The Magnificent Seven * James Bond Theme * The Gremlin Rag * Hedwig's Theme * Hushabye Mountain * The Prayer * All Time High * The Throne Room (And End Title). "This collection is a welcome addition to the repertoire of any string quartet or advanced middle or high school orchestra." -Melissa Gerber Knecht, American String Teacher. October 15, 2018 Funny music ! in French : excellentes réductions pour orchestre à cordes. en concert, le résultat est très spectaculaire !